I’m starting with breakfast, which I’ve narrowed down to my 20 favorite, most festive recipes. Next up are entrées and sides, followed by desserts. Let’s do this! Happy breakfast planning for all of your holiday celebrations. Be sure to tag any of your creations #minimalistbaker on Instagram so we can see what you cook up. Cheers! The rosemary blueberry coconut oil scones are the best! I don’t normally like scones but they sounded good for Christmas morning. Plus, they are a minimalist baker recipe and all the recipes that I have made from you/Dana/the posts are really good. And these were so good they all disappeared and I had to make the recipe again today. It turned out wonderful again ( sometimes the second time I make something g it doesn’t work as well). This is my new favorite. I’m a muffin maker at heart but now expanding to these delicious scones! Thanks, Minimalist Baker!!! Thank you so much for such wonderful creative ideas! Happy Holidays and Season’s Greetings to You and John! Thank you for posting this, Dana! I will be making the whole wheat pancakes Christmas morning for my family! I also wanted to say thank you for all of the beautiful recipes you have created. As the only vegan in the family and being 21, I have a lot to prove when cooking and baking. Your recipes have been a hit every single time! I’m making your Apple pie and pumpkin pie for Christmas eve, your pumpkin cookies for Christmas day, and the pancakes. No one can tell they are vegan! Have a very merry Christmaso! So great! thanks for sharing, Annie! You’ve been busy! Looking forward to eating some more of your delicious creations! ? 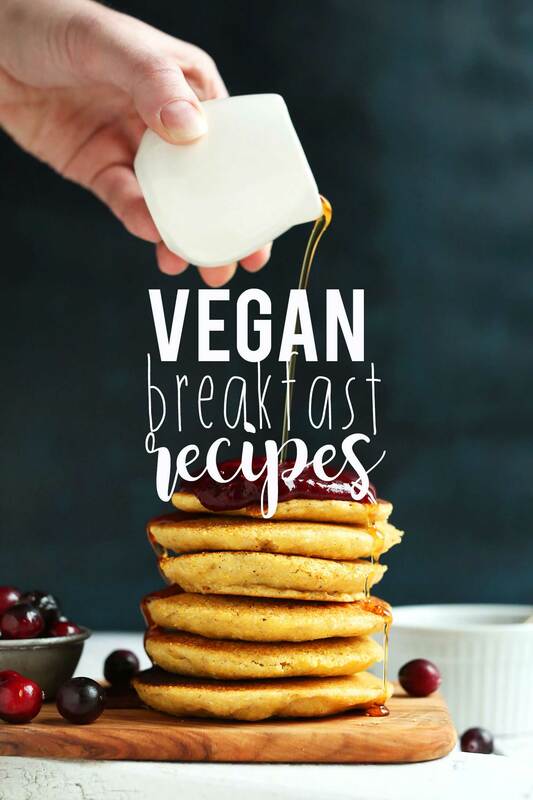 I love your whole grain pancakes and I can’t wait to make more of these recipes! So kind! Thanks and Merry Christmas, Caitlin! That butternut squash banana bread sounds awesome, can’t wait to make it. Love the display and the list layout, beautiful work! I have to put in my vote for those cornmeal pancakes…I made them shortly after you posted them because my husband had been having a cornbread craving, and they were AWESOME! So great! Thanks for sharing, Barbara! Let me know how it goes, Rachel!! xoxo + Merry Christmas! Wow, these all sound divine, but omg, those cinnamon rolls!!! You know, when I think breakfast, I always go with scrambled eggs and bacon in my brain. Which clearly is NOT vegan. But for me, it’s the hardest meal of the day to make vegan. But eggs do scream breakfast to me still so I appreciate all these options you have posed. Nifty. With the coconut baked oatmeal going to the top of the list for me! !